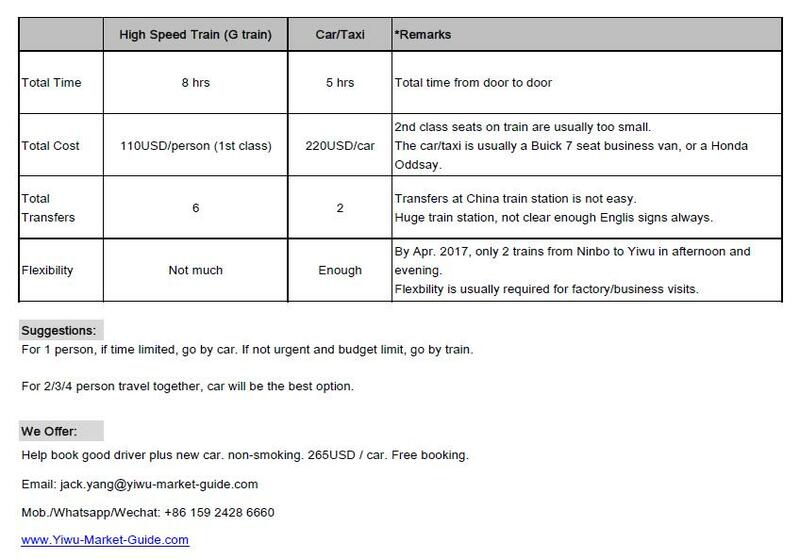 Travel from Shanghai to Ningbo then Yiwu, Train or Car / Taxi? * Click above picture to download a clear PDF version travel guide. Hi TD, train can easily cost you 8 hrs on road. Car takes about 5 hours at normal traffic. Car can save 3 hrs on road. It may take 2 - 4 hours in Ningbo depend on if you need to visit factory. There are only 2 trains (14:43, 16:26) in the afternoon from Ningbo to Yiwu. Car has more flexibility. Train has 6 transfers. Car has 0 transfers. Train costs about 110/person. Car costs about 220USD/car (best for 3 person, max 4 person). For 1 person, if time limited. I highly suggest you go by car. For 2/3/4 person travel together, car will be the best option. We can help book good driver plus new car. non-smoking. 265USD / car. Free booking.